This was my first guest review and I have to say I was very excited to be doing it on a stunning pen that really is one to behold. The OMAS Paragon Limited Edition in Arco Celluloid. This pen was limited to just 200 pieces. 75 in Gold, 75 in Rose Gold & 50 in Rhodium trim. I have had a couple of months with this pen and have grown to love it in every aspect. From its light and well balanced weight to the obviously gorgeous Arco celluloid. The buttery smooth nib and its ease of writing while allowing some flare if you want. It has been a very enjoyable time with this one. I say that as I was loaned this pen by Bryan @ Kenro Industries and handing it back will be a difficult task to say the least. I will start with its medium size and as you can see in the photo it is comparable to the Mont Blanc 146. The section is very comfortable and the cap threads are not noticeable at all. I will say that I am one who is distracted from a pen when the threads are sharp and dig into my fingers. The finish is extremely polished and smooth to the touch with little to no step from the section to the body. The cap has 3 gold bands and a gold clip. The clip has been mounted beautifully and sits almost as if it is levitating. It is made with a roller ball on the end of it that is not just pretty but functional as well since it really does roll. It allows you to have it secured in your pocket but still produce it without much resistance. In other words it will stay put till you decide to take it out. This is very important since it retails at $995 usd. Even the underside of the clip is fully finished. That kind of detail even a Mont Blanc 149 does not have. The body of the pen is a 12 faceted design that really sets it apart. Especially when the light hits it and you see those layers of Arco celluloid. Two sides of the pen expose the layers “end” and this where celluloid really shines and takes your breath away with its beauty. The process to produce this celluloid is complex and takes about 100 days to complete. 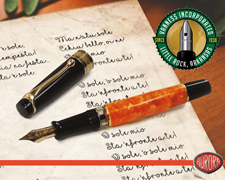 Developed back in the 1930’s by Omas they brought it back for 2013 and reminded everyone just what a beautiful pen can look like. It has an extreme amount of depth and looks almost wet in any lighting. While it is a beautifully subdued brown it will get noticed! It is a piston filler and that is something Omas has being doing well for a long long time now. The action is smooth and the facets match up perfectly. Something that they did with the Omas 360 as well. That 3 sided pen shows how precise they are made with the piston lining up to the body perfectly after every fill. Matching 12 sides leaves even less room for error or differences. They are fanatical with details and the overall presentation as well as quality of workmanship shows it. The nib is where a place where Omas lives and breaths. They are made in house and a joy for everyday writing. Journaling, signing documents or taking notes at a meeting it just flows. It has a nice soft yet controlled feeling about it. The nib choices are wide as well even for the LE pen. There are 2 versions with different sizes. 18k offers an XF, F, M & B while the 14k extra Flessible comes in XF & F. I have seen some say the Extra Flessible comes in a medium as well but I could not find any official confirmation of that. Either way you have a diverse choice for your pen. These are not meant to be used as a spencerian pen. Yes the nibs are soft and springy but they will not tolerate being flexed out. If you do this they will spring or worse bend. The nibs were designed to give a comfortable writing experience day in and day out. They will however tolerate some flare here and there. You can see this in the pictures and as well as the video review I did. The last detail is the feed. It is indeed an ebonite flat feed that is machine ground by a skilled worker who makes sure it is correct. Overall this is a pen to acquire if the means are there and the design intrigues you. Having this pen inspired me to want to write more than I have to simply because it truly does look as good as it writes.